Economy Minister responds to CNN's Christiane Amanpour who asked about Israeli construction in the "occupied West Bank." 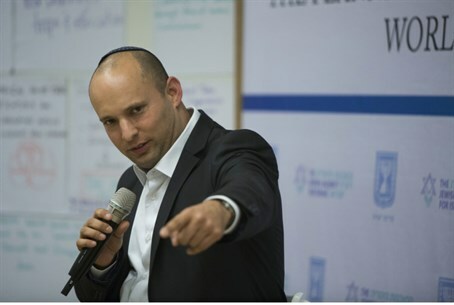 Economy Minister Naftali Bennett (Jewish Home/Bayit Yehudi) on Monday pointed out in an interview on CNN that there is no such thing as “Israeli occupation” in Judea, Samaria and eastern Jerusalem. Bennett was asked by Christiane Amanpour to comment on Housing Minister Uri Ariel’s decision last week to issue tenders for 20,000 new homes in Judea and Samaria. Amanpour tried to interrupt Bennett by saying that “occupied West Bank” was “an international term” but Bennett continued, “I don’t accept it. This coin, which says in Hebrew ‘freedom of Zion’ was used by Jews 2,000 years ago in the state of Israel, in what you call ‘occupied’”. “One cannot occupy his own home,” stressed Bennett. He also reiterated once again that he opposes the so-called “two-state solution”. “I think trying to enforce [an] artificial state in the heart of Israel, in Jerusalem, is a grave mistake,” Bennett declared. “If the Palestinians want peace they have to do one simple thing: Recognize Israel as the Jewish homeland. That’s all. But if they don’t do that, if they don’t recognize Israel as the Jewish homeland, they can’t expect peace,” he told Amanpour.